Quite user friendly Empire army if you ask me. Not too many war machines but 2 of the with engineer ensured that they pose a significant threat to a variety of foes. Huge unit of Halberdiers were there to protect the characters. Wizards and Archlector provided nice variety in the magic phase and good defence against enemy spells. Some knightly orders were good counter charge force and flagellants were there just to add flavour. The army was not easy to defeat though at all. It could deny points very well. 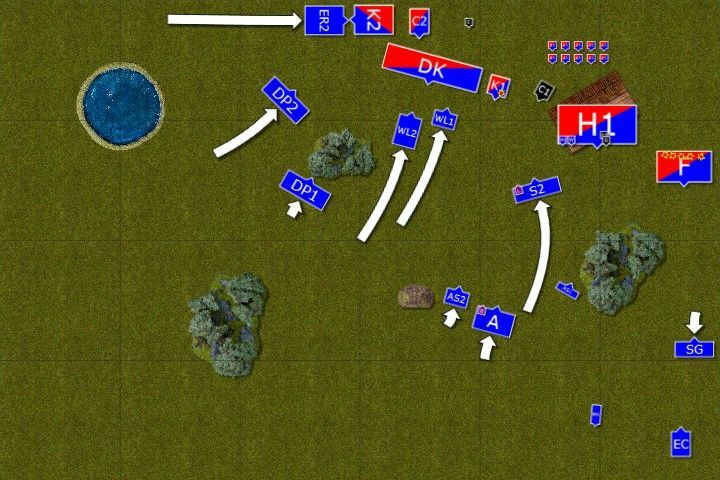 It looked to be quite defensive but with huge blocks of infantry supported by cavalry it could actually go on offensive mode and try to grind enemy down. Hatred and some prayers (or wildform) on lowly state troopers were thing to be afraid of. Some nice hexes from Heavens magic also were there to help. Building very close to the Empire's deployment zone meant the human army could go defensive. It was a castle formation with Halberdiers being very well protected in the building and knightly orders securing the flank. 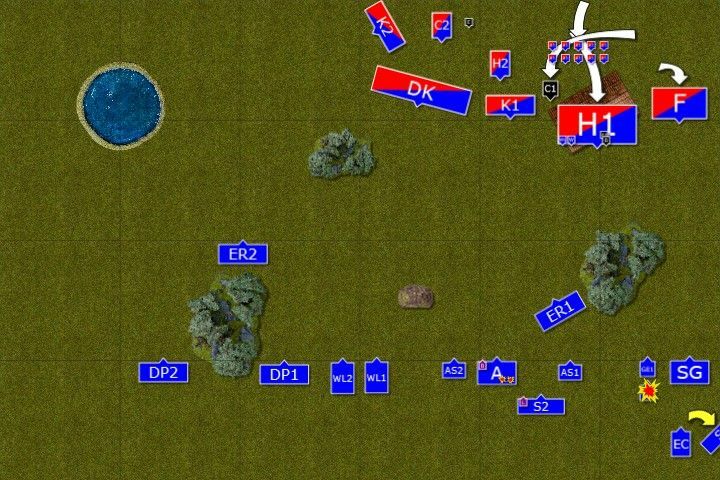 I decided I will go in outflanking manoeuver with some combat units. 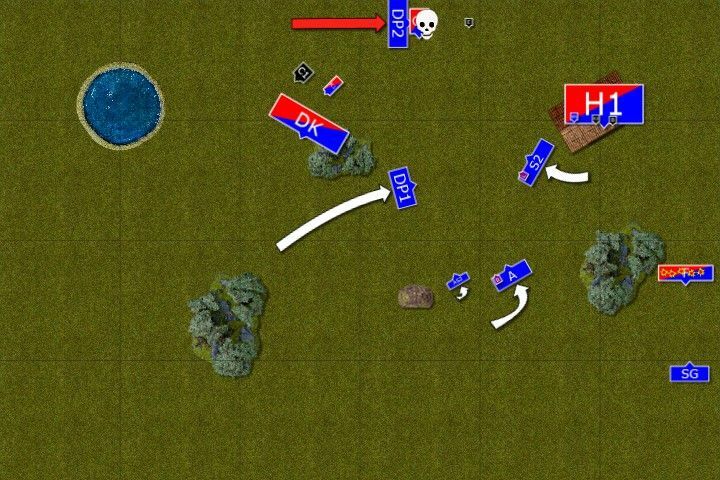 In the meantime I will use magic and shooting to get rid of the Hellblaster and position regiments for all out attack. I wanted both Swordmasters to head for the building as I though they had a chance to grind Halberdiers down with repeated attacks even at the cost both regiments. Or maybe they could scare the characters off too. I tried to hide eagles and eagle claw behind the building from the cannon. Sea Guard was there to shoot Flagellants (as I knew where they are positioned early enough) and to prevent them from joining the fight in the centre. I also thought that 2x Dragon Princes and 2 x White Lions should be able to defeat Demigryphs if they attacked all together. That complicated things for me a little. In particular due to Chainlightning but also thanks to the combination of Thunderbolt/Chainlightning. Both spells, even if cast once have a chance to cripple any unit I have. Beast magic is, on the other hand, very good for Demigryphs, already powerful. Double Wildform can even further help Halberdiers. Ah well, let's see how strong the winds of magic are going to be! Max unsurprisingly won the roll-off and Empire had the first turn! 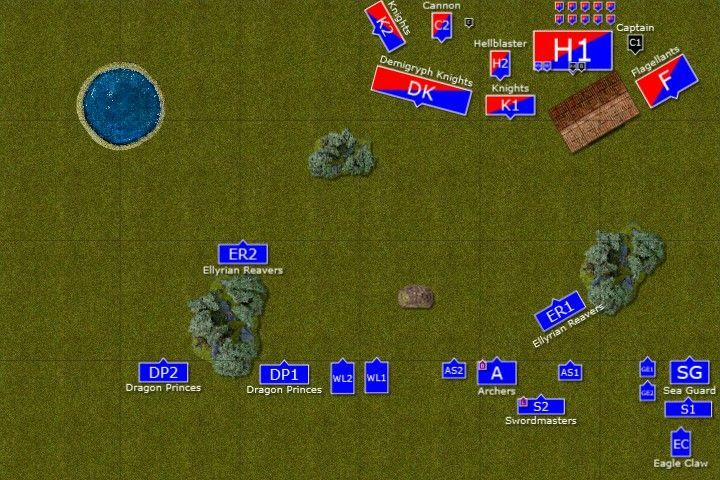 Elven troops, in particular on the left flank, move forward at a double. Well placed fireball destroys the crew of the hellblaster which is a great achievement as that infernal war machine can cause a lot of trouble. Other shooters pick their targets and a few knights and flagellants also fall. Ellyrian reavers draw the Flaggellants forward as planned but are caught by the magical lightnings as are other elven troops nearby. 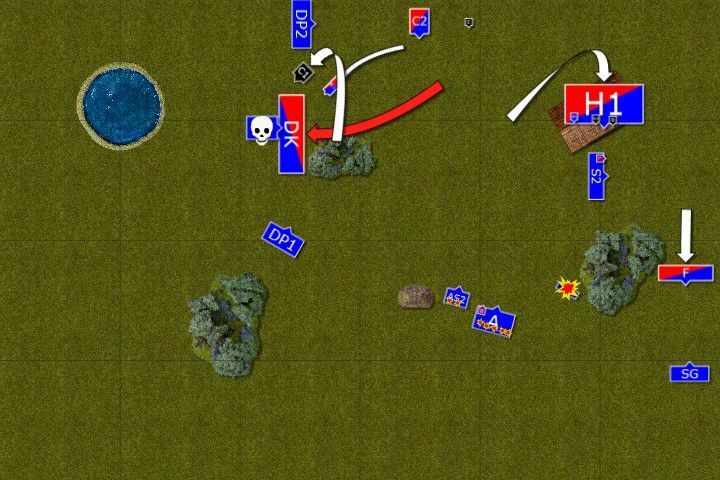 Empire troops maintain close formation. Only cannon crew had some troubles as they loaded a dud and now were busy repairing their war machine. 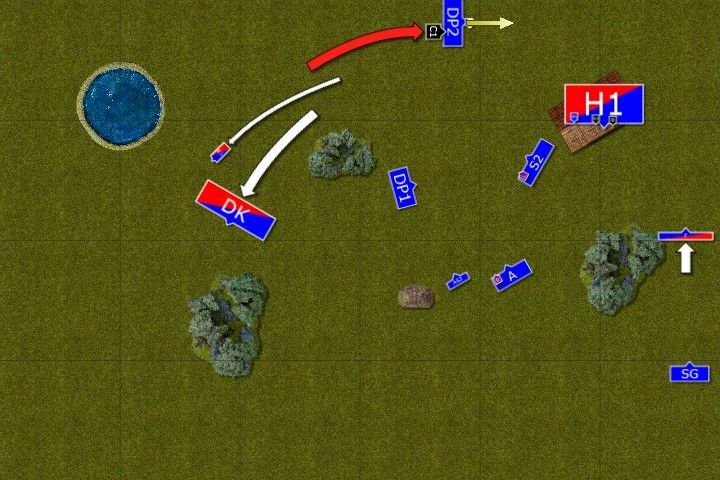 The assault force on the left flank move to positions where they can still threaten the enemy but be at a relatively save distance. The foe is powerful and well entrenched so some magical or shooting support is required. Unfortunately all the efforts are not quite impressive this time and only one knight and several flagellants die this time. 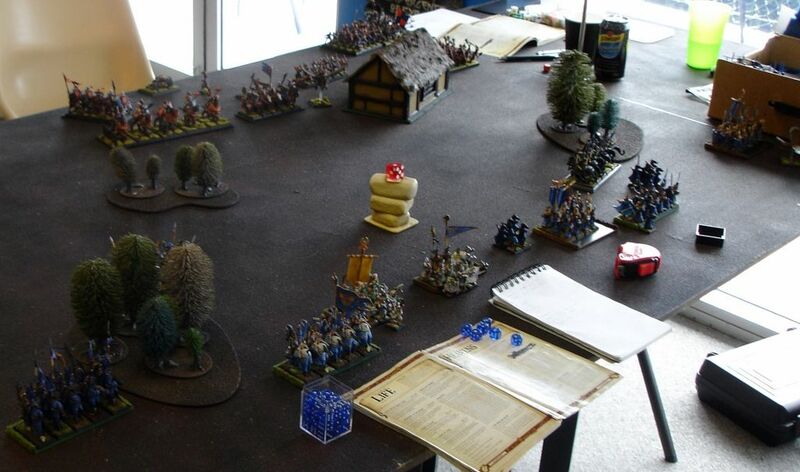 Empire troops fill the gaps and cannon crew repositions to a new placement to be able to target elven bolt thrower. Wizard Lord once again gets his spells through and chain lightning jumps through a few units. White Lions, however, take the most sever damage but stubborn Chracians keep advancing regardless. Will Empire troops ignore the elves this time again? Elves had to push forward or risked being killed by the magical storm. 4 units surrounded the Demigryphs, while light cavalry diverted any possible help. Loremaster led his bodyguards to help from another flank. Unfortunately, magic and shooting were still inefficient. It was clear that Empire inactivity was a disguise for a counter attack. Pegasus Captain swooped down and he attacked exposed flank of White Lions. Champion challenged and even wounded the captain but his companions still withdrew. Probably to avoid the fate of another White Lions regiment, destroyed by the Demigryphs. Halbardiers went out from the building, led by the Archlector and BSB and blocked Swordmasters from joining the fight in the centre. Wizards were in the house and some archers went in to keep them company. The cannon crew redeemed themselves for the previous blunder and destroyed elven bolt thrower with a well placed cannon ball. You can't lose if you have the support of the TO himself! Powerful Empire strike left the gaping hole in the centre of the elven formation. The units had to regroup. Dragon Princes avenged the noble sacrifice of the reavers and destroyed the Knights. The road to the cannon was open. Another unit pulled back as they had a suspicion that the Empire captain might not be that vulnerable to their flaming lances. Swordmasters also swift reformed and moved out of sight of the Halberdiers. Loremaster managed to sneak in a fireball and all archers were destroyed. Then Sisters of Avelorn, despite the odds, managed to find the target well and wizard's apprentice also fell down. Flagellants were still preaching the doom and it looked like it was certainly coming. At least for them. Empire troops kept attacking. Demigryphs destroyed White Lions, who left alone stood no chance to the ferocious attack. Halberdiers moved back to the building to rescue lonely Wizard Lord. Another chain lightning took more elven lives and some regiments started to look miserable. Dragon Princes charge the cannon and overrun into the Engineer. 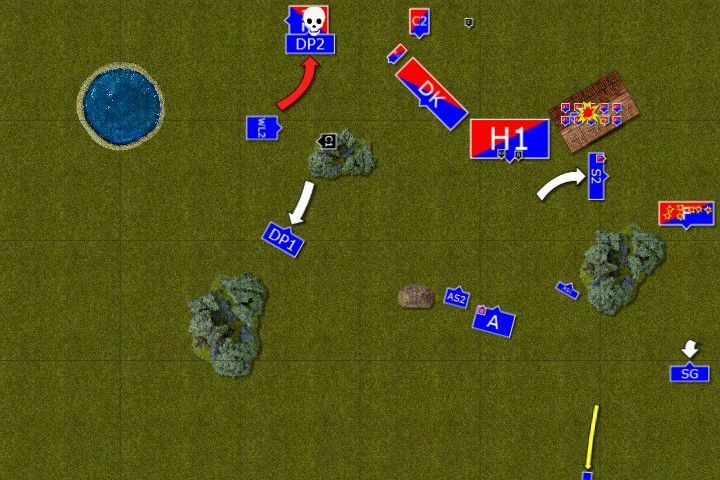 Other troops manoeuver but neither magic nor shooting is successful (Edit: nothing like rolling double 6 for winds of magic only to fail to cast the very first spell :D). Sea Guard shots down a few religious fanatics though. Pegasus Captain charges Dragon Princes who kill the Engineer but still are forced to withdraw. Luckily for them they are not caught in pursuit. Other troops move away from the Loremaster so that his magic is less dangerous. Even flagellants figured out it is more beneficial to stay alive and preach inevitable doom for longer than to face one themselves and be silent forever. As it was clear that Empire troops didn't want to fight anymore and that the elven army lost cohesion, some of the troops shot some farewell arrows at the human regiments. Larry the Loremaster cast a fireball at the lone, escaping knight but the fire extinguished over the distance and the imperial armour saved the last member of that regiment. Only Flagellants were not that lucky and were shot down to the last. After that salvo both armies disengaged and re-grouped after bloody but not resolved battle. A draw! The last game ended up with a draw that, I think, was quite satisfactory result for both of us. However, I wanted to highlight far more important thing that occurred this game. 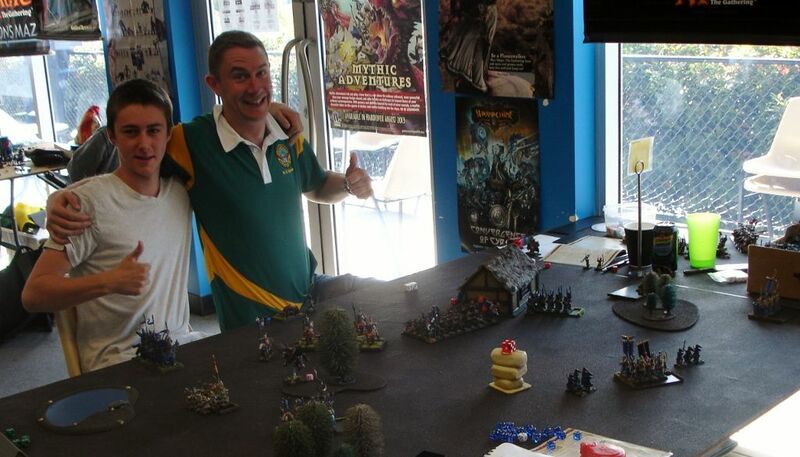 Max was a very pleasant opponent to play against as he was cheerful and easy going. However, I wish there was a Best Sport nomination so that I could vote for him. I had fantastic 6 games this tournament but what distinguished Max from my other opponents is that he was very sympathetic when some bad luck occurred to me. Although it was beneficial for him and his army, he was not cheering when I lost my Swordmasters turn 1 or when I failed to cast first spell and lost my 12 power dice when good magic phase was needed. What is more he offered some kind words as he knew well that that is the nature of the game and sometimes the dice gods are fickle. Thank you so much for that, Max! Many veteran players should learn from you! 1. Deployment - as always a crucial stage. I shouldn't have placed these units so close together. While I was save from the cannon turn 1 I risked the lightnings and paid for my stupidity. That units of Swordmasters was very much needed to keep the Halberdiers in the house. If I had them there Halberdiers would not risk moving out and leaving the wizards in the house or would have risked the building to be occupied by elven troops. 2. Over extension of the forces - I ignored the captain and that was my mistake. 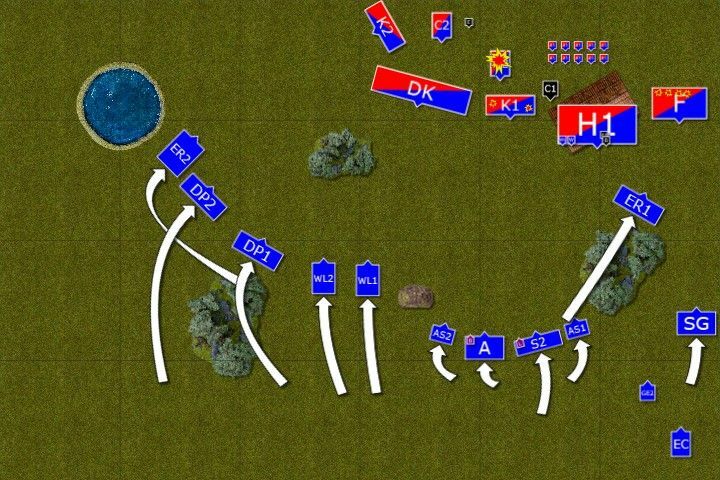 I had no unit to counter him so that he attacked the flank of the Lions. I could have at least try to present the front to him so that there were more attacks directed at him. Instead I lost both units for nothing. 3. Magic pattern was to cast Spirit Leach to try and kill the Wizard Lord and follow with magic missiles. I succeeded in killing the hellblaster and archers but failed to do anything to the wizard and could not get that last knight. A little bit luck on Max part and he also saved Pegasus Captain when only a 6 was good enough to save him! At the same time I was lucky to get that last Flagellant and save the draw. 4. Moving Loremaster and Swordmasters to support was good but I was too close to the building and had no units to block Halberdiers from moving out or divert them afterwards. Hence the counter attack was very successful and I was lucky I managed to withdraw them to the safety. 5. 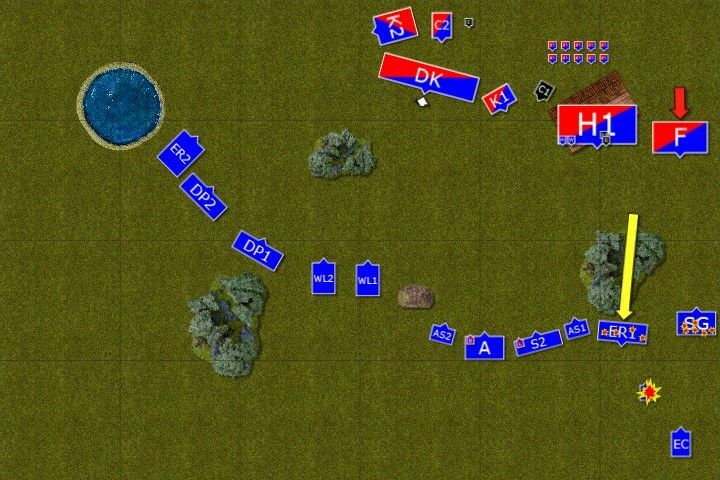 Max played very good defensive game when it was beneficial to him to deny my the flanks so that I could not outflank him. He had good spells to fight me from afar and the only thing I guess was not good in his plan was to move flagellants forward to let them be shot to pieces. Well, I guess that's the last game of the Australian Masters! I ended up 12th out of 16 players. I won only one game, had 2 draws and 3 losses. That was, unfortunately, the worst performance at any tournament I attended in Australia. If you look at the performance with my own army list it was one win, one draw and 2 losses. Hence, no surprise I was not that happy. 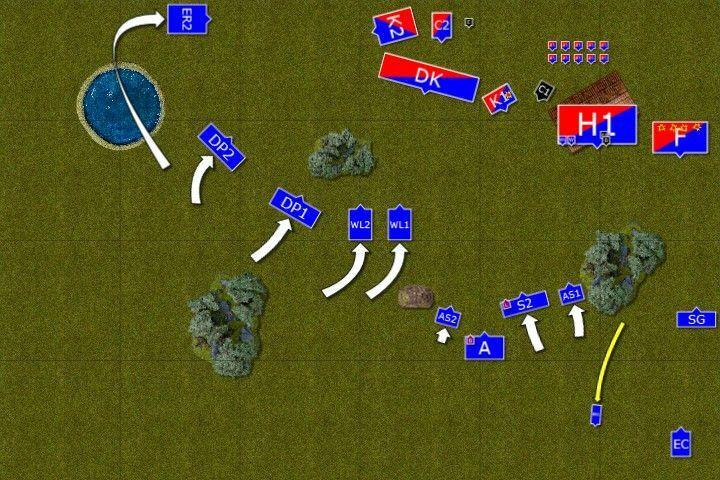 But it was even more important to post the battle reports. I was very happy to be able to compete against the best players from Australia and I like to think I learned a lot. The bright site is that even writing the reports I could identify bad decisions that led to lost games or to the situations where I lost points unnecessarily. That means that I can improve! It even reminds me about first tournament I attended 2 years ago with MSU force. I didn't do that well but learned from that experience and all other tournaments I took part I finished top 10. So while disappointed with myself, especially that I know some of the mistakes were avoidable, I take heart from these lessons and observations that when I played well I could be an equal opponent to any other player present. The best examples were my first two games! The fact that we played 2 games out of 6 with swapped armies got me thinking. It was a very interesting experiment and I must admit that to an extend I even slightly regret that in game 3 I got High Elves. I was really curious about other armies and how I could play with any other one of them. Maybe I should start playing with other armies, casually, simply to experience yet another dimension of that hobby? There was an interesting discussion on army lists on forums and various podcasts. Many people didn't give my list many chances but I think that the reports showed this army has good potential. I didn't lose because I was dramatically outmatched. I lost as a result of bad decisions. Of course the fact I could not prove some people wrong adds to my disappointment bu at the same time I know there is a way to show that MSU can be actually a good option for the army. 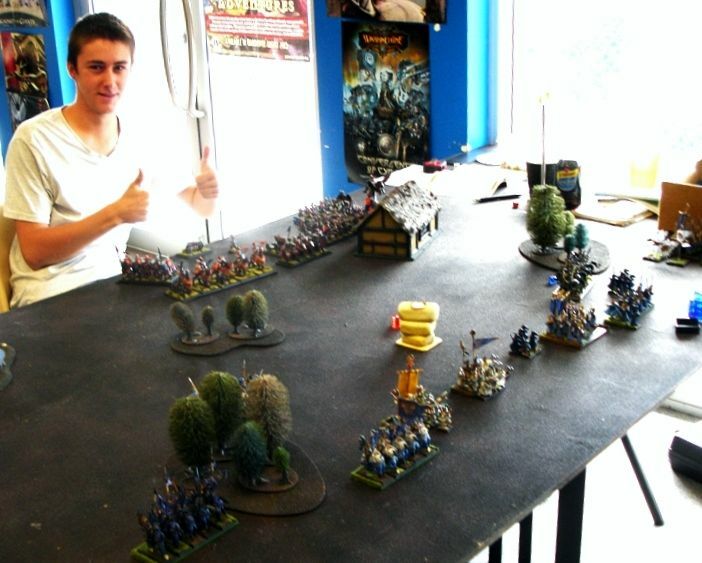 The fact that another MSU force, Daemonic army played by Nick Legrand, ended up very high seems to be a good proof. 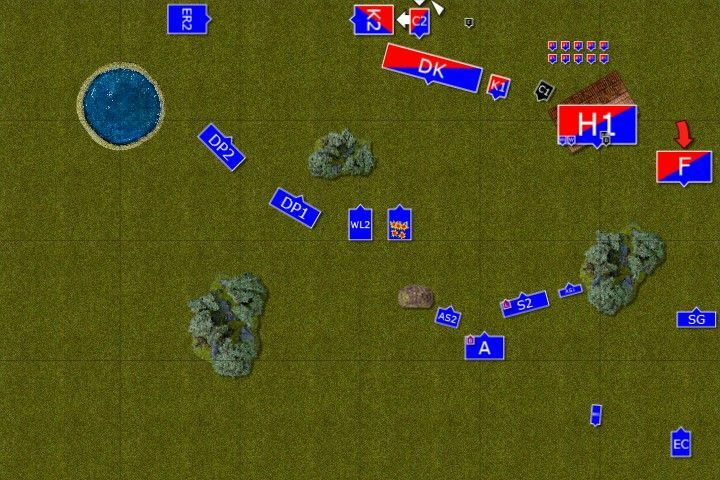 On the other hand, it was also very interesting to see how other players would perform with and against that army in the army swap part. Joel won against Empire led by the overall winner 11-9! While Nick L lost against VC led by Nick H. It is also amazing to see that there were repeated match ups a few times and the results were varied. That simply shows that despite different scores the skills of players were in fact quite close. That is great news as it means that I can get better with the army I really like. There is still so much to learn and I am really looking forward to it. Of course the evolution of the army is inevitable but I really like the fact I have the force I can comfortably use in the shape it is now and still put up a good fight! First of all big Thank you! for a lot of work put into preparation of the players pack to Simon Kwok. It is tough job and usually the person responsible has to take a lot of criticism. Simon prepared a pack that in my opinion worked very well. The aim, in my understanding, was to reward variety and unorthodox approach and that was fully achieved. I am not sure how big part in that players pack has but I assume it was a very significant influence on players approach to that tournament. While they did try to make their list tough in the frame of the Swedish Composition allowance it still resulted in a variety of army lists with some unusual but still dangerous choices. I believe Vermin Lord is one of these! Of course one can always try and should try to improve the existing players pack based on experiences collected but I firmly believe it is a solid foundation for whatever will be used in 2014 Masters. This tournament would have not happened and would have not been the fantastic event without amazing crew of Canberra Good Games store. Guys, you were amazing and I am sure all the players are very grateful for all the efforts you put to make everybody happy. Thank you so much! This tournament would have not been as good without Australian ETC former-player current-barman, Roy Diprose! Thanks a lot for all the help with rules during the games and patience with army list submissions, Roy! There are many, many people I wanted to thank on that occasion. I was really surprised by the amount of support I have received! I would like to start with people who helped me prepare to the tournament, offering advice and sacrificing their precious time to discuss things with me. In alphabetical order: Adam R, Bugman, Eastern Barbarian (aka wardancer), Hinge, Jimmy and Targ, you provided your valuable insights and I know that whatever worked well in my games was thanks to your advice. Thanks a lot guys! To all the supporters on Ulthuan.net (Ele even started a dedicated topic to do so! Cheers, mate! :)), warhammer.org.uk and wargamerau.com! It was an amazing feeling to know there are players who cheer up for me and I am really sorry I didn't perform better. I hope the reports made up for it as they are dedicated to you all and I also hope you had a good read, regardless of the results. I also would like to thank Dwellers and Watchtower podcasts crews for the analysis of my lists. The opinion of veteran players is always very valuable. Cheers guys! I read through all of the reports for the masters and I think you did a fine job! I'm still undecided on whether army swaps is a good idea for a masters tournament, but I'll let masters level players make that call. I wouldn't worry about proving that MSU is a viable list building tactic. I think that most builds are viable but some are more "point and click" where others take more planning and more work. I've never felt that your list was ever completely outmatched in any report I've read. Most of your losses could be explained by some combination of mistakes and dice rolls. 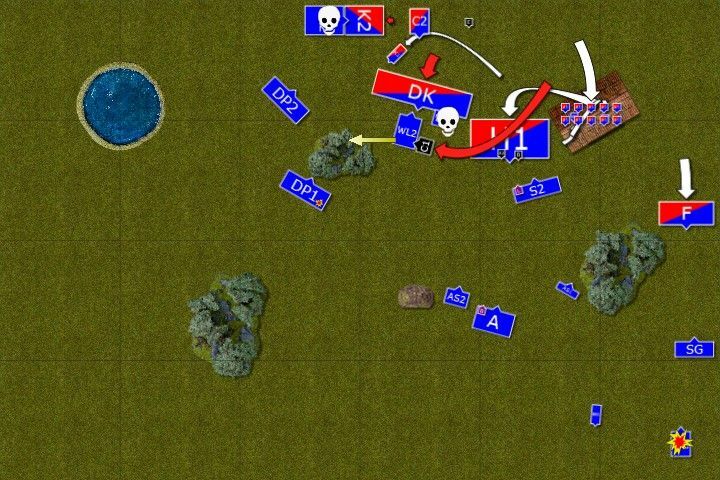 Does your army require making less mistakes than other builds? I'd argue that it does but MSU certainly has its advantages. Has this event made you want to try any other armies out? And has this tournament caused your HE list to evolve? The army swap is always a controversial topic (in a good way!) but it makes this tournament so unique and I don't think the organizers would like to let it go. Of course there are some suggestions like making it just for single round but we will see this year. It all depends on what 9th edition is going to be and which version of the game will be played this time. In 2014 they still had the usual army swap though. From that point of view I know I didn't do a good job at all. Usually, when I make mistakes that cost me games I actually take something positive from such outcome. I know I can do better next time and I can improve my skills further because it was not some lucky/unlucky event I had no control over. But not this time because I had to bring ma A game each turn and I didn't. It simply didn't matter if I did it better next time. I think MSU concept has a higher risk factor. It relies on swarming the opponent so each element needs to be in a perfect spot to attack. 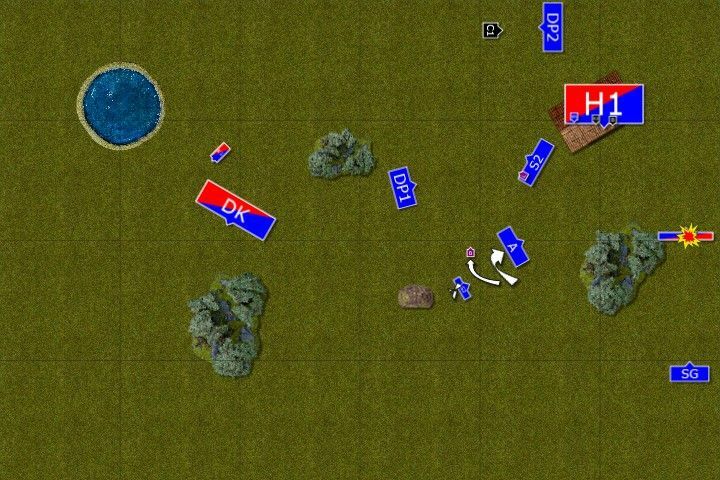 It means I have to position units in such way that even unlucky dice rolls are not going to affect the outcome. I like it, I like that type of a challenge so I continue practicing it and do my best to adapt the skills to changing balance of the game. If you mean other armies from other army books then to an extend yes. I saw great opportunity in getting to know the enemy better by playing their armies. However, despite my hopes for being able to have a game once in a while with different force, after Masters I had barely enough games with my own HE. If you are asking about other armies in the frame of HE book then no. I wanted my army to evolve but mostly thanks to me getting better. I felt down and it took me some time to get back on track but I kept discussing MSU concept and playing with it even if I saw that it stopped being such a novelty and people turned their attention to typical powerful choices, trusting more in the army list as usual.